This brand new holiday complex (Trigor City) development lies in a peaceful area not far from Varna city center and very close to the busy resort center of Golden Sands. Also it is next to Varna Free University “Chernorizets Hrabar”. There is a bus stop directly opposite with regular buses into Varna. 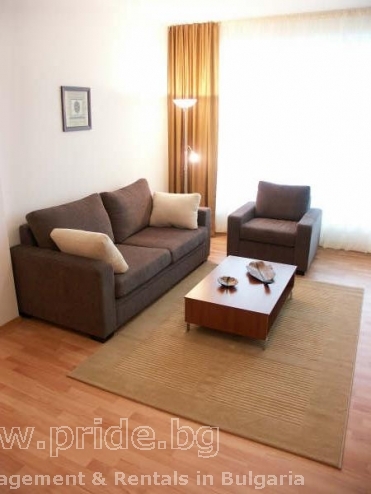 This stylish apartment is perfect for short term and long term rentals. We believe that this apartment would be the ideal place for anyone thinking about moving to Bulgaria to really get a feel for the area. It is on the second floor and has one double bed and a sofa bed. The kitchen is fully stocked with all necessary equipment, comfortable living area with Air-Conditioning, and a partial sea-view terrace with outside furniture. Trigor City is a privately owned apartment complex which consists of five apartment buildings laid out in a horseshoe configuration. It is located in the Alen mak area of Cabacum. Cabacum beach is a small costal resort near Golden Sand, and has its own sandy beach, bars, cafes and restaurants. To access the beach you can get the chair lift from one of the neighboring hotels. You can also walk from Cabacum Beach into the main resort of Golden Sands. Golden Sands is the second largest beach resort along the black sea coast. There are again a fantastic range of shops, bars, restaurants and discos here, and you can spend hours wondering around the main commercial areas. The main attraction though is the beach – 4km long with soft “golden sands” and gently shelved shore. The resort lies at the foot of the Zlatni Piasatsi nature park, where virgin forests descent right to the resort center. There are loads of other activities to do on Cabacum beach or Golden sands, such as diving, parasending, jet skiing, water skiing, voile ball and jeep safaris.